In some funny news out of the NFL, Pittsburgh Steelers superstar safety Troy Polamalu had his hair insured for, yep, $1 Million Dollars. 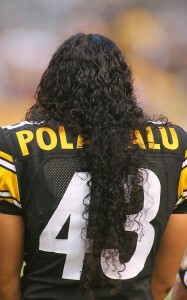 Polamalu is that guy you see in various commercials with a very long flowing mane of hair. Fittingly, he is the spokesman for the shampoo brand Head & Shoulders, and they want to make sure that nothing bad happens to that hair. It is insured by Lloyd’s of London, and they wouldn’t release what would constitute having to pay that fee. Would someone have to shave his head in a prank? That sounds like a bad move anyway. Probably shouldn’t mess with the hair of one of the fiercest defensive players in the league. The USA had a very tough match-up against, of all teams, Brazil. Brazil has put together a nice international team over the past few years. Their center, Tiago Splitter, will actually play for the San Antonio Spurs this year. They’ve left him in Brazil, but he’s really come along, and is expected to be pretty good in the NBA. Team USA struggled in the first half, and Brazil even had a 3-point lead heading into the half. The game stayed close all the way to the very end where Brazil had a chance to tie with just 10 seconds left. But, they simply couldn’t get a shot to fall and the US held on for the win. Kevin Durant led all scorers with 27 points. USA 70, Brazil 68. Finally, in the soccer world, there was a lot of drama circling Team USA head coach Bob Bradley after the World Cup. He started off hot, but, in the end, the US didn’t exactly play so well when it counted against Ghana. Plus, US has ambitions to get to the next level in world soccer competition. They want to be a top team. So many were curious if US Soccer was going to commit to Bob Bradley going forward. There was a rumor that the US was going to bring in a top foreign coach to really whip them into amazing shape, but in the end, Team US decided to renew Bob Bradley for four more years. Hopefully, he’s able to get Team USA to the next stratosphere.